A GEEK DADDY will be co-hosting another great The Toy Insider Twitter Party on Friday, September 29, 2017 from 11am - Noon EST sponsored by Skyrocket. Join us for a fun hour of witty banter and awesome prize giveaways as we chat about the brand new Sky Viper V2450 GPS drone, which was named one of The Toy Insider’s Top Tech 12 toys of 2017! With professional-grade ArduPilot firmware, the Sky Viper v2450 GPS Streaming Video Drone outperforms every drone in its class. Built-in GPS provides an autonomous flight experience similar to that of much pricier hobby-grade drones. Using a network of satellites to trilaterate its position in relation to waypoints, the GPS Streaming Video Drone can maintain its coordinates in a hover without drifting away in the wind. Positional awareness also enables Return to Home, a feature in which the drone flies back to its launch point with the touch of a button. Advanced enough to satisfy discerning enthusiasts, this drone is also lightweight, durable, and safe enough for beginning pilots ages 12 and up. Click here to read The Toy Insider's full review! 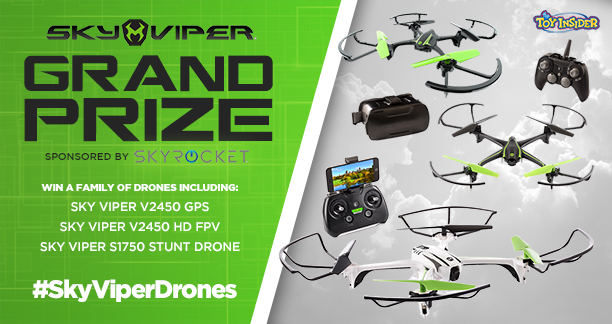 Four lucky winners will win the Sky Viper V2450 GPS Video Streaming Drone, and one grand prize winner will win a family of drones, including the GPS drone, the v2450 HD FPV, and the S1750 Stunt Drone. 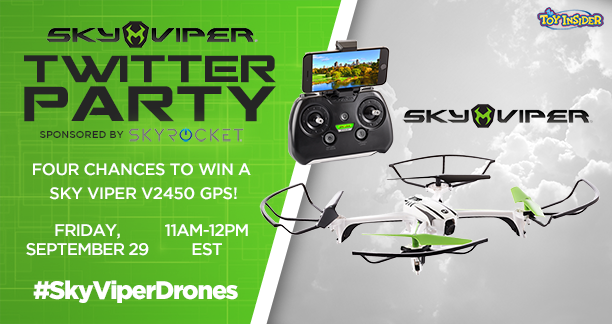 For a chance to win you need to RSVP in advance of the party, follow @TheToyInsider, @Geekdad248 and @SkyViperDrones, plus participate in the Twitter Party conversation including the hashtag #SkyViperDrones in your comments. Must be a US resident to be eligible to win prizes.